Sitecore comes with a number of different field types to capture data in the content editor. 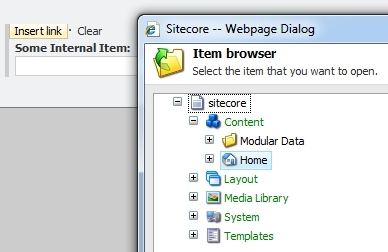 One available field type, the Internal Link, can be used to allow editors pick a another Sitecore item as a reference. Though this field type may be appealing, it is not a recommend field type to use. In fact, you should absolutely never use it! This post will explain why you shouldn’t use it and how you can use other fields as alternatives. Now that you know why you should avoid internal links, you probably want to know how to achieve the same thing in Sitecore where an editor can link to another item. Fortunately, there are several options to accomplish this. The droptree is exactly what its name suggests, a dropdown that allows you to pick an item from a tree. From here you can pick an internal item within the tree, just like an internal link. Unlike an internal link though, the raw value stored in this field type is the Item ID, so its a perfectly safe field type to use and probably the closest to an internal link. If you use Sitecore a lot and leverage its full set of capabilities, you’ve probably used unique datasources on sublayouts. One important thing to note is that the DataSource field itself is an internal link. This is something important to consider when creating data source items and debugging issues around rendered sublayouts. Nice bit about setting a general field to internal only. didn’t know that. Hello friends, nice post and pleasant arguments commented at this place, I am genuinely enjoying by these.